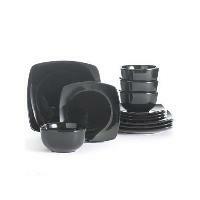 What is Culinary Arts Dinnerware? 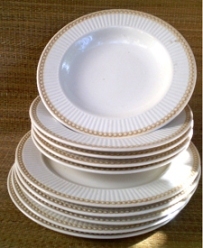 The term "culinary arts dinnerware" can be used to refer to restaurant dinnerware or restaurant plates that are white. Culinarians or culinary artists are sometimes referred to as cooks or chefs. The art involves both skillfully preparing foods that are pleasing to the eye as well as enjoyable to the palate. Many chefs prefer to serve on whiteware because the dishes don't compete with the aesthetics of the meals that they artfully prepare and serve. 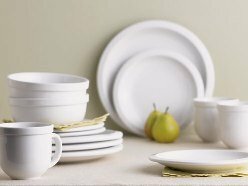 Simple patterns or solid colored dinnerware can also be considered dinnerware for culinary arts if the pattern doesn't take away from, or even enhances the visible appearance of the culinary creations; however, white dinnerware is definitely the preference. Back when I originally wrote this page, Culinary Arts Cafeware was a dinnerware pattern that was going strong. The pattern is ideal for a chef who likes to artfully display meals. It is porcelain whiteware. Since then, it seems that the Tieshan associated brands has gone out of production, but you can still find the patterns if you are willing to do a little searching. 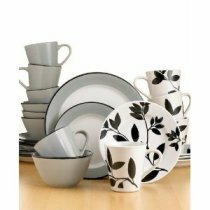 You can usually find patterns from the Culinary Arts brand of dinnerware at replacement companies or through second hand sources like internet auctions, yard sales or estate liquidations. The dinnerware by Tienshan, Inc. was very original. Personally I love the Culinary Arts patterns, Ruffleware and the Victorian Pearl. The style is definitely unique. I haven't been able to find out what happened to the Tienshan company or its related brands. I assume that they went out of business or altered their product line away from dinnerware. The company was founded in 1982 and seems to have perished around 2009 or 2010. While their dinnerware was in production, they made some pretty awesome patterns available.